Designed to provide strong, yet flexible protection for manual tasks, the Ansell Duzmor Plus 87-600 Ultra-Thin Unflocked Latex Gauntlet Gloves are constructed from ultra-thin natural rubber latex, are unflocked for increased tactile sensitivity and textured to enhance grip. Offering a low level of chemical resistance, these gloves are suitable for some applications in the cleaning, maintenance, agriculture, automotive, metal fabrication and construction industries. 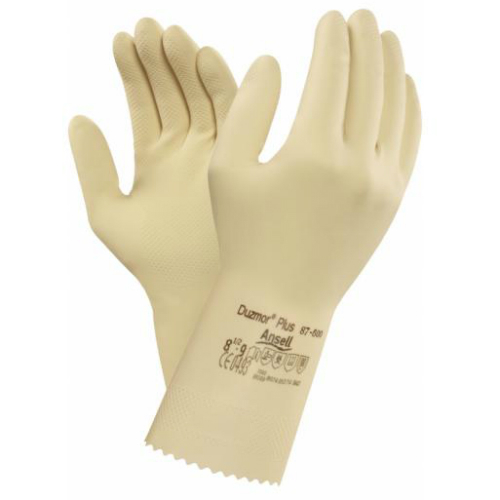 The Ansell Duzmor Unflocked Latex Gauntlet Gloves have been tested in accordance with EU standard EN 374-1, and certified as protection against micro-organisms and chemicals for minimal-risk tasks. They have also been rated according to EN421 as protection against radioactive contamination. The Ansell Duzmor Plus 87-600 Ultra-Thin Unflocked Latex Gauntlet Gloves are available in four sizes. Please measure the circumference of your hand around the knuckles (excluding the thumb) with your hand open and your fingers together, and the length of your hand from the tip of your middle finger to your wrist.